Back in 2000 David Blunkett announced the introduction of 'Academies'. Schools which were deemed to be failing would be removed from Local Education Authority control and although still publicly funded could be sponsored by local businesses or individuals. The theory was that, in areas where the schools were doing badly, appropriate funding and support could be given and the school would improve. Businesses and companies would support the school, share information and technology and some great co-operations would be forged. The theory sounded really promising. In actuality bringing business and entrepreneurs into schools means that you have someone who wants to gain from their involvement. Up to half of the academies currently in operation are run by religious groups or affiliates - for example the Emmanual Schools Foundation which now runs 4 schools in Middlesborough, Gateshead, Doncaster and Northumberland. If you chose to send your child to a specifically denominational school then that's fine, but to see it suddenly change overnight? Academies do not have to abide by the curriculum except for the core subjects of English, Maths and Science. They are free to teach whatever else they feel appropriate - this includes creationism as long as they teach it alongside Science. Academies can employ pretty much whoever they like and pay pretty much whatever they like. This can be peanuts - with your children taught by the proverbial monkeys - or astronomical 6 figure sums for some new heads put into position by the Government. The Government have continually moved the goalposts for what is considered satisfactory by OFSTED, and schools which would previously have been seen as 'Improving' are being forced to change to academies. Even when schools are deemed 'Satisfactory' or 'Good' , they are being forced to become academies. Even when the local population, parents, pupils, staff, Heads and Teachers don't want to become an academy, schools are being forced to change. Academies can pick and choose their pupils, they do not have to accept someone who lives next door or has siblings at the school. They do not have to accept students with additional needs. When a school faces enforced academisation, if the Head and/or Governing body refuse to accept they can be removed and replaced by a Government-appointed board. Despite no proof whatsoever that they are succeeding in what they were invented to do, the Government has pressed ahead with converting and in 2012 the scheme was extended to primary schools. My 3 and 5 year olds are now in this position. Their school was deemed 'unsatisfactory' by OFSTED last year and although next years SAT's are expected to be the highest results ever, they are being forced into academisation. 3 of our teenagers went to that school and did exceedingly well, my 2 little boys are doing exceedingly well. All 5 have been very happy at that school. I've worked in nursery, school and college with students of all ages, I have no problem with that school. There are several schools in this position in North Manchester alone, so there must be hundreds in the UK. It's frustrating to say the least and I worry about where we will be in a couple of years time when my children are still young and fragile and learning the very basics for their entire academic path. If a school wishes to change to an academy and the deal they've been offered by the individual or company involved suits them and will benefit the pupils then I would accept graciously, but when no-one wants it and the school is doing really well, why? Wow. I can't believe that job advertisement. 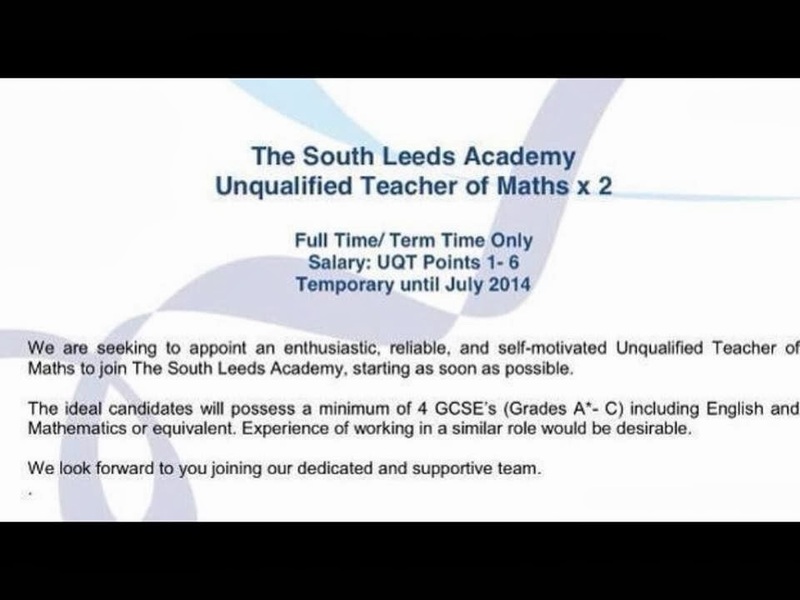 4 GCSEs does not qualify anyone to teach Maths. I find the academisation on schools very worrying, the fact that these schools can, effectively, do as they please is alarming. I wouldn't want to send my children to one and I can fully understand your concerns. Thanks Pippa - it is really worrying. I'll be home schooling them if we have a bad outcome, I really will. Unfortunately it's really not up to us, it's not up to our LEA, it's all in Government hands and our local politician has gone out of his way to protest against rights for Muslims and gay marriage, so isn't really on the same wavelength as actual people. Fingers cross! Hope this wont be approve. Interesting reading this a couple of years on. With our school facing change this year, I'll be interesting to see what happens to the future of it, fingers crossed all will be good! It was interesting for me too actually! initially all of my fears were unfounded and we were okay, but our sponsor has since been taken over themselves, so the worries are back. Already we've seen the school budget cut by £30k due to the employment of an overseer that the school have to pay for. This is a lot to lose from a teaching staff budget, and a worrying development. 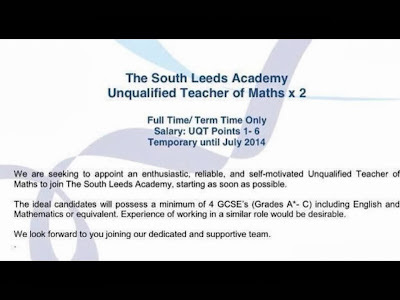 We shall see...I hope your academisation goes well and is beneficial to your children.